Has this happened to you? Maybe you stumbled upon a no-name brewpub somewhere and found the perfect pale ale. Maybe, buried in the back of your local beer store, you found a dusty bottle of rare barleywine. Perhaps a friend turned you on to a beer that changed your mind about a brewery or a style. Write about a beer experience that took you by surprise. Indeed, I've already hinted at my discovery... There was this bar/restaurant in the gleaming metropolis of Norristown, PA called the Moody Monkey. A bunch of friends and I went there for dinner one night and were pleasantly surprised to see a huge beer selection. We were just out of college at the time, and thus were used to the joys of Natty Light and the like, so when handed a gigantic beer menu, we were pretty much lost. Since we had no idea what to order, we opened the menu, closed our eyes, and randomly pointed at the menu. As it turns out, two of us, purely by chance, had selected Ommegang's Hennepin. It came out in the 750 ml bottle, caged and corked, and pretty much blew our minds. I'd never seen anything like that at the time. When I poured it out, it looked kinda like a "regular" beer, but the taste blew my mind once again. It was a revelation, and while not really my first experience with craft beer, it was the most influential. 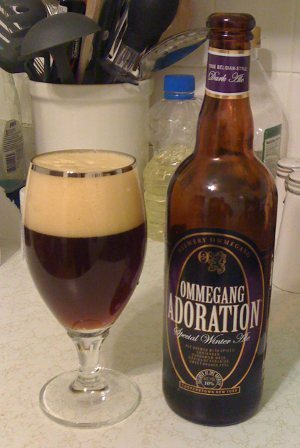 From that point on, I was ready to explore the beer world, and went out of my way to find other Ommegang brews and I'd always try something new whenever I could. Alas, the Moody Monkey fell on hard times not long after my discovery of Ommegang. I don't know why, but apparently the owner "forgot" to renew the liquor license, and all of the sudden that fantastic beer selection was gone and it wasn't long after that that the place had to close down. So yet another well balanced Ommegang brew that I'm most likely going to fall back on every year (like I do with a bunch of other Ommegang brews). I've also recently come into possession of Ommegang's Tripel Perfection, which I'll probably get to soon (look for a post, probably in January). This page contains a single entry by Mark published on December 3, 2010 11:33 PM. Double Feature: Holiday Ales, Part 1 was the previous entry in this blog. Decembeer Club is the next entry in this blog.